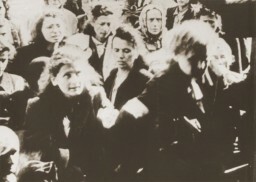 Displaying results 1-10 of 277 for "Warsaw ghetto"
On April 19, 1943, the Warsaw ghetto uprising began after German troops and police entered the ghetto to deport its surviving inhabitants. 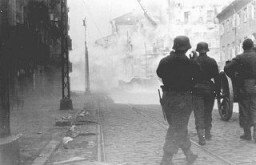 By May 16, 1943, the Germans had crushed the uprising and left the ghetto area in ruins. 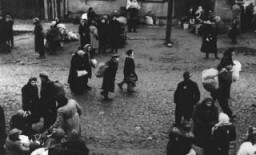 Surviving ghetto residents were deported to concentration camps or killing centers. 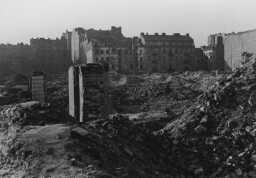 During the Holocaust, the creation of ghettos was a key step in the Nazi process of brutally separating, persecuting, and ultimately destroying Europe's Jews. 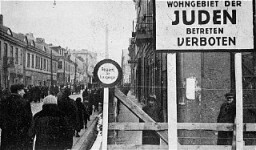 Ghettos were often enclosed districts that isolated Jews from the non-Jewish population and from other Jewish communities. Living conditions were miserable. 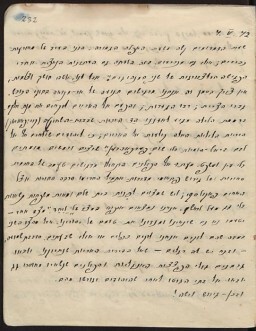 Under terrible living conditions in the ghettos and facing the constant threat of deportation, Jews sought to preserve their humanity and their culture through song and verse. 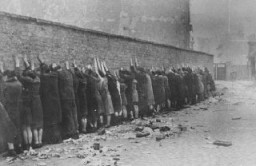 The Oneg Shabbat underground archive was the secret archive of the Warsaw ghetto. 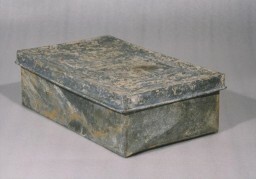 The term Oneg Shabbat, which refers to the traditional Sabbath gathering of members of the community, was applied to the underground archive because its organizers held their regular, clandestine meetings on the Sabbath.